The appearance of the faces of people in photographs is a problem in itself. The first is not ethical, the second is that believers can sue you. If you are not famous for the laws in Turkey, you can sue someone who takes your photo. That's why you need to publish photos of people's faces in any place. There is a saying that the world is small. He may encounter your publication and make you feel guilty. If you want to see the faces of people, you must get the written permission of the people you photographed. This is a big problem for a photographer, as we know that people are hidden in the lines of the faces of their real expressions and memories. But I think your head is better than worrying. Although there are no faces, it is possible to take beautiful and meaningful photographs. The photo above is a photograph taken in Kocatepe Mosque in Ankara. I pulled in that area years ago. I took this photo when I saw the two-headed woman sitting in the bank with the mosque. Do not get me wrong. Religion is not only associated with people dressed this way. You certainly do not understand that. I only emphasize how the two women support the posture and one of the rear-view glass semantically. I remember when I was taking photos. It was hard to get all of the glass into the photo, and I had to lean over. Already in the photo, it is imperceptible that it is imbalance. If you look at the bottom, you will see that the side that looks like a sidewalk step extends from the side. The fact that the photograph was taken in a very wide perspective and the strong position of the glass makes this error relatively invisible. There is one point I would like to draw attention to here. A photograph can be technically flawed. But it is relatively semantically strong, which leads to technical failures. This has always been the case. Still, it is a fact that the photograph is curved. So I do not deny it. If I send one of the stock photo items, I will be rejected one hundred percent. After taking the photo, I made the black tones and shadows more effective by making fine adjustments on the computer. Thus, the meaning of the photo increased even more. I could have vanished by cutting the bottom part of the photo that would give you a sense of the curve. I did not do this because you can see that the meaning in the photo is more important than the technical details. I shot the photo with an eighteen-millimeter focal length lens. The objective was Nikon. By reducing the diaphragm I aimed to make the glass clearer. So I showed the clouds with the mosque. The reasons why clouds look so clear and magnificent are the processes I mostly do on a computer. I preferred vertical angle. The object we shoot in the photo tells us that the photo should be taken vertically or horizontally. Here, the minarets of the glass reached upwards, indicating that a photograph should be taken at a vertical angle. Of course, according to what the photographer wants to tell, this rule can also be compromised. However, in general, vertical angle preferences are made in this way. Today we always prefer the vertical angle in our phones. This is our easy way. However, the object we are photographing may be telling us something very different. Still, when we look at photos on our phone, it is easier to look at the pictures taken by holding the phone vertically, normally. This is now starting to be related to taking pictures in different areas. So it is important that you do not look at how photos are taken anymore. This means that non-professional users can have different preferences for vertical and horizontal angle photography preferences. That's why we can not judge anyone. That's why we can not say you're making a mistake. The world is changing and photo habits are changing. This is an undeniable fact. Although I did not have much technical detail in the photo, I said a lot. It was to explain why the technical details were not important. The important thing is the meaning in the photo. What do you see when you look at this photo? 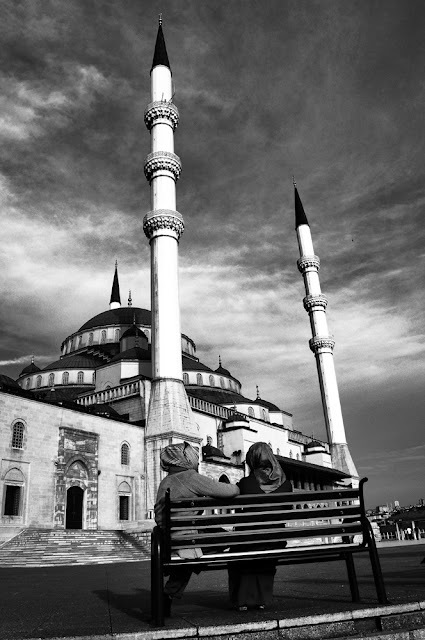 Two women sitting in the courtyard of the mosque? This is actually true. There are really two women there. But replace yourself with those women. There is a sense here that a worship can be seen as a source of peace. When photographs are evaluated in a different way, there is a formation of religionists at the beginning of the religion symbol. This is the strongest meaning in the photo. Other things reinforce and support this sense. Clouds, sitting women and other things are things that support this sense. Again, the large door that opens on the left side of the photo is a support item. It stands out as a place to go up stairs. Another means of empowerment here comes from the technique of photographing. When you look at the photo, you will see the minaret, the woman and the door forming a triangle. When you start to look at the photo somewhere, you come to the point where you wander all the photographs and start again. It is a technique that strengthens the meaning. Most of the good photographs are drawn in this way. The provision of such geometric shapes through the eyes of the photograph provides a more aesthetic and meaningful posture with a push from human nature. Human nature likes to look at geometric shapes. Even if these geometric forms are not drawn directly, feeling their presence will bring about a semantic outlier by eliminating aesthetic concerns. The basis of good photography education is to be able to teach these technical details and semantic supporters together. There is no doubt that the factor of selectivity in perception is also involved here, which makes it easier to understand and apply these abstract elements. Many such details are actually supporting factors that make photography more intrinsic and intellectual. The main factor is the subject itself. As you have noticed, the stronger the subject is, the stronger the meaning and the burden of the other side supports. If you ask us where it brings us, it brings to my mind that hundreds of people at the top of my writing come out of the photo. The faces of people appear as the main factor for reflecting their characters and the presence of supporting elements is felt very little in the photographs where the human face appears. That's why photographs of people's faces, portraits, are so popular. It gives semantic integrity to the photographs we shoot by showing the human face. This is mostly the case. Later on, this semantic element can be supported with various accessories. However, it never takes place side by side with the main subject. If you look at my photo above, it is obvious that you can not see a face. However, the supporting elements are strong. This is the summary of the above photo. The previous spelling was also very enlightening for you photograph lovers. In the writing of the story, I mentioned that the gravestone, a sleeping old man and a living fountain can tell. You can click on "Stay Alone Photo Story". My first writing, "Lonely Armchairs Photo Story", is a very interesting story telling a picture of Ankara Castle. You can also click on "Lonely Chairs Photo Story" to access this article. Hakkımda Ne Var? Ne Yok?